Before I even start this blog, can we all note that this particular set of napkins is made of "imported components?" Exactly what part of paper can you not find in the United States? How could this possibly be cheaper? 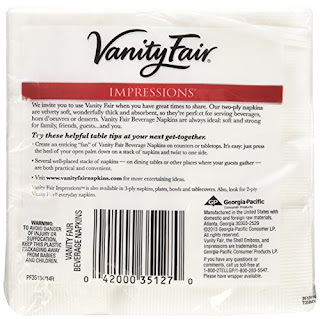 Much like Angel Soft toilet paper, Vanity Fair comes with a lot of ethical and environmental baggage. Where you buy your napkins might seem low stakes (or even irrelevant, as lots of people just skip them completely), but napkin sets at the grocery stores have more behind them then you think. First, these packs of napkins often come in small sets wrapped in lots of plastic. This is a problem, because our oceans and all creatures on Earth (including humans) are drowning in plastic. Buying small sets of plastic-packaged stuff is a big part of the problem. Also, let's all take a second to question why something to wipe food off our hands needs sterile plastic overpackaging. "No, don't use that napkin, it has a stain on it!" Second, they are made by Georgia Pacific, which is owned by the Koch Brothers. It doesn't mmatter what political party you are in, the Koch Brothers are not your allies. They spend millions on millions to protect the richests' interests and to sway our leaders to do their bidding. They want an oligarchy, not a democracy, and if you have a problem with that, you shouldn't give them your money. Last and most importantly, they aren't recycled. There is literally NO REASON that exists that a tree should come down because you have schmutz on you. 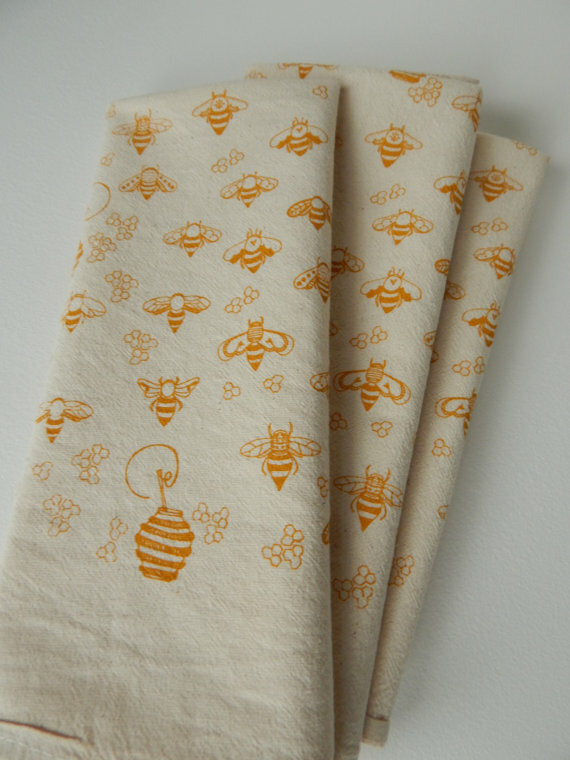 In the good old fancypants days, you pulled out the good cloth napkins when company came over. At our house, we do the opposite. 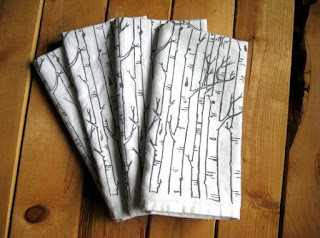 If lots of people are coming over, we will use paper napkins, otherwise we use cloth. 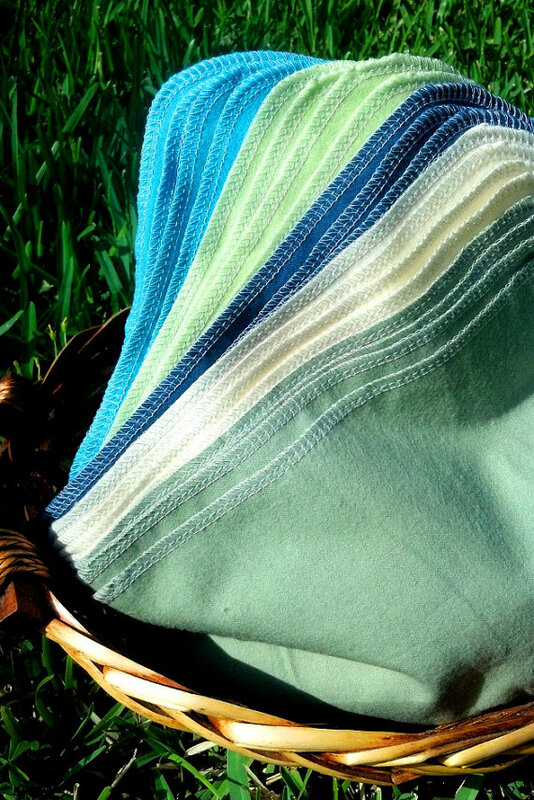 Have some basic sewing skills? 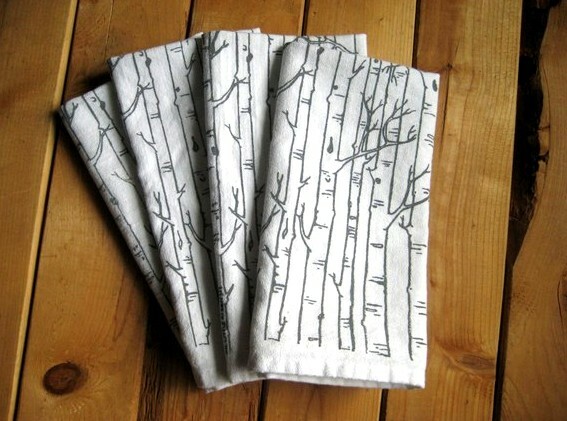 Then you can make napkins yourself with minimal trouble and barely any money. 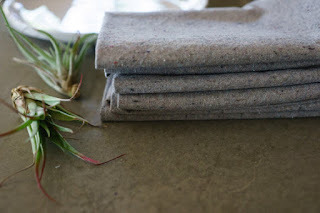 You could even make them for housewarming or holiday gifts! If that feels to crafty to you, you can even get low key cotton and linen napkins on Amazon. I hope this is a sign this is becoming more mainstream everyday! 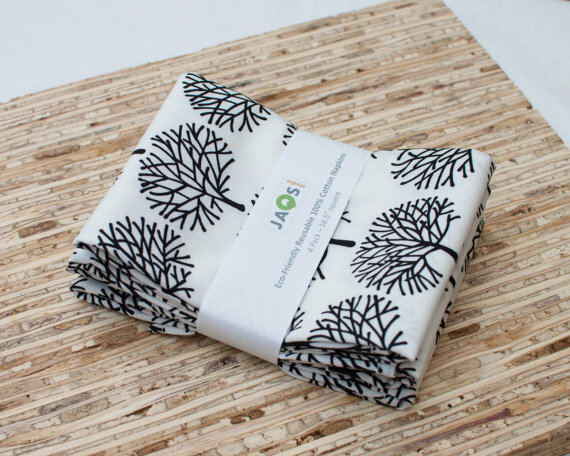 Seventh Generation 2 Pack of 500 unbleached napkins- 90% post-consumer waste- 15.57 (or about 3 cents a napkin). Probably enough napkins to be set for life. If you like the white ones, you can get these instead. Another one of the more common recycled brands that you can find in a good chunk of grocery stores. They have a bulk set of 3000 napkins (so a lifetime supply or great for businesses, schools, etc.) for 45.48 (about 2 cents a napkin). I may have mentioned this already, but fresh paper napkins are an abomination. There is just no reason for them to exist, and if you can't get them recycled at your store, buy them online and tell your grocery store owner why they won't be getting that money. You can find so many brands- Marcal, Natural Value, and more so don't settle on this one. 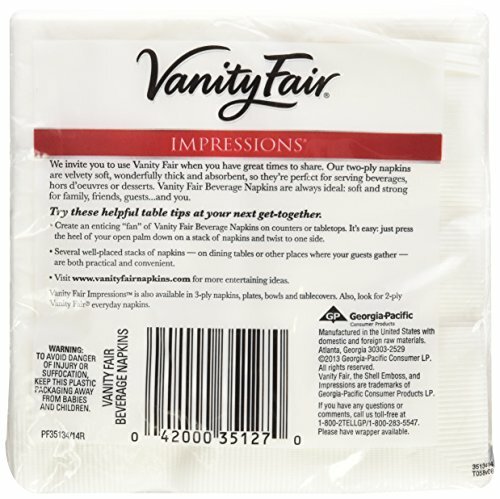 No matter what, it is easy to avoid Vanity Fair napkins and all of the Super PAC shistiness that comes with them. If we want big corporations out of our government, we have to stop giving them our money. Every dollar we spend says "this is ok with me," and even seemingly meaningless choices like napkins add up. 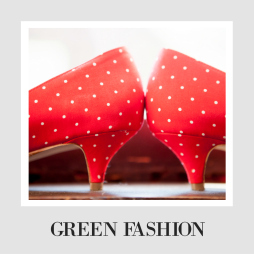 Want more shopping inspiration? 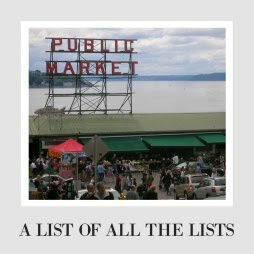 Check out my Giant List of Shopping Lists for tons of ideas and simple switches! To tell you the truth, I always have grabbed the paper napkins for as long as I can remember, but I want you to know after reading this, I am buying cloth napkins asap! I love this! Thank you! Awesome, Stephanie! It really is a nice change. Interesting read! We don't use paper napkins in our house, but I had never really thought about the politics of napkins! I thought ab out stuff liked this when we decided to use cloth diapers on our son before he was born. 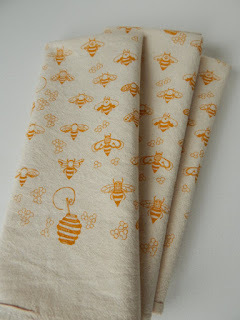 But then weighing the options-cloth napkins (family cloth wipes, etc.) means more laundry. Which means more water consumption. And detergent. And energy uses. Paper biodegrades, as well as plastic. We pick our battles. but this is really insightful! it just comes down to individual choice. Jasmine, so true, and you definitely have to weigh individual priorities. I am glad there are also recycled paper options for most paper goods now, because you can kind of get the best of both worlds.